63 year old female runner with left hamstring injury, left hip osteoarthritis and femoral acetabular impingement syndrome (FAIS). Presents with left hamstring pain after 3 weeks into running training. Has marathon in 6 weeks. Past medical history includes prior left knee arthroscopy for partial medial meniscectomy. Exam revealed left hamstring tenderness and decreased eccentric strength, dynamic hip abductor weakness on single leg squat, and restriction on hip internal rotation and adduction with complaint of ‘pinching’. Standing AP pelvis X-rays obtained. 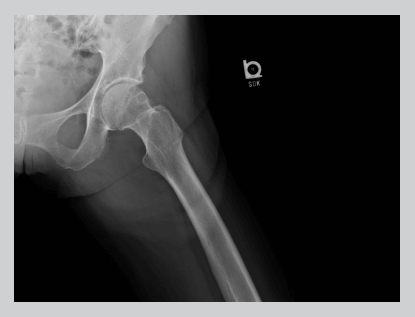 Dysplasia and osteoarthritis noted in hip. Osteopenia (follow-up bone mineral density completed with her family physician). Tight window of time for marathon training. Conservative, non-invasive management for quick return to training dictated treatment approach. She had strength and gait deficits contributing to the load of her hamstring and the hip in walking and running. Goal was to achieve marathon competition with minimal pain and improved running gait. Selection of brace into rehabilitation approach as patient did not want injections, the Unloader Hip brace provided immediate pain relief for ambulation which allowed her to progress through her exercises, training, and treatment for improved gait. Athlete returned to training after fit of Unloader Hip brace, but cross trained on elliptical until strength and gait improved. Returned to run/walk progress for training and completed marathon with alternating intervals of walking and running. Did not return to clinic after marathon. Use of the Unloader Hip Brace allowed us to address pain and function in an athlete resistant to invasive treatment. The brace minimized the load to the hip as we progressed her through gait retraining and strength/flexibility improvements with combined home program and manual therapy.